For the seventh consecutive year, Waldron was recently recognized as one of the region’s Top Corporate Philanthropists. This recognition by the Puget Sound Business Journal reflects Waldron’s ongoing efforts and commitment to enhancing its community’s vitality and social health. 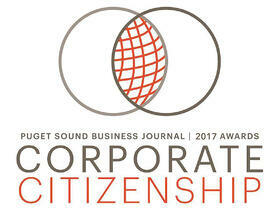 Each year The Puget Sound Business Journal recognizes the contributions private sector businesses of all sizes make to Washington’s non-profit organizations through publication of a list of the top 75 corporate donors, recognizing both monetary and volunteer contribution. The awards were announced at the annual Corporate Citizen Award luncheon on May 24, 2018. Waldron gives back by dedicating time, treasure and service to social sector organizations in communities where we work. In addition to providing staff with paid time off to volunteer, Waldron supports social sector organizations in domains including health, science, education, social justice, human trafficking, civic dialogue through public media, and poverty alleviation. In addition to direct company philanthropic donations, Waldron employees contributed personally and through the company’s matching gift program, along with performing over 887 volunteer hours in 2017. Waldron’s President, Mike Humphries said: “We’re very proud to once again be recognized for what we do to support the less fortunate in our communities, to address crucial community needs, and to help solve some of our global community’s challenges.” We are grateful to be able to stand among this distinguished group of caring organizations and their people”. Learn more about Waldron's philosophy and engagement in the community.